Black Lives Matter! Ferguson Weekend of Resistance! Sign our Revolutionary Youth Manifesto! 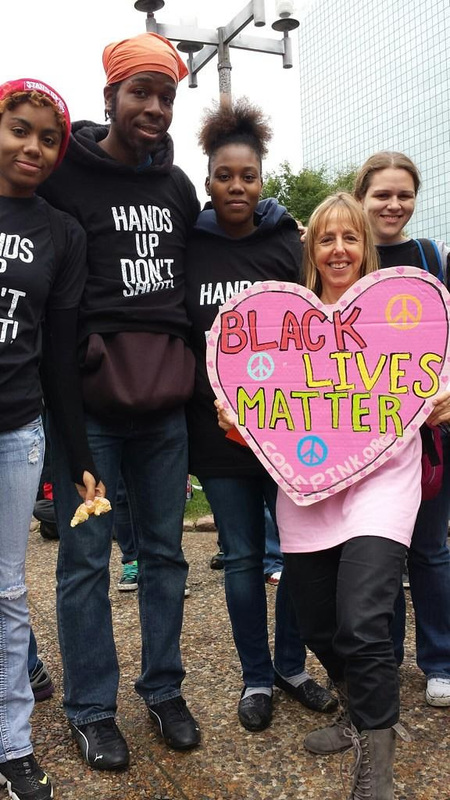 Last weekend, #FergusonOctober Weekend of Resistance brought together activists from across the country who took to the streets of Ferguson day and night in anger, frustration, rebellion, and solidarity. CODEPINK joinedm arches, awomen’s gathering, faith-basedcivil disobedienceat the police station, asit-inat the University of St. Louis,banner dropsat the City Hall, and so much more. It was all the more poignant when just a day before the two-month anniversary of Michael Brown’s murder, the life of another black teen was taken by St. Louis area law enforcement. Check out some of our picturesfrom the weekend. 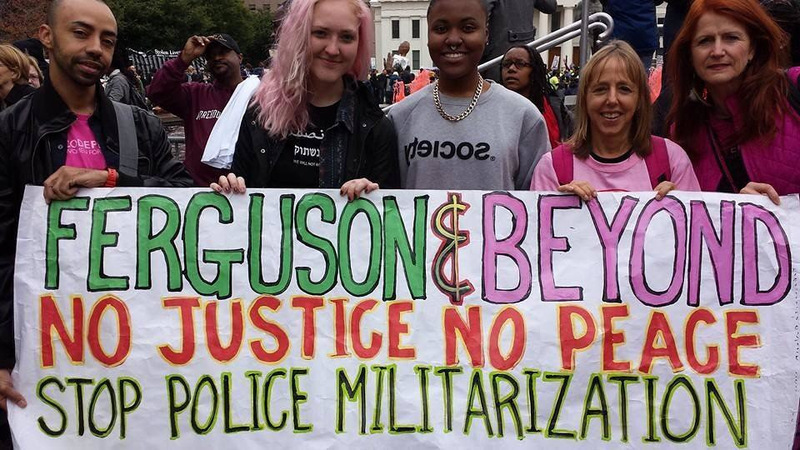 At CODEPINK we are committed to supporting the organizations already doing this important work, and we’re excited to soon kick off our campaign to help local communities demilitarize their police. Through ourCommunities Organizing to Demilitarize Enforcement (CODE) campaign, we will support efforts such as local resolutions and national mobilizations to remove/or keep the weapons of war out of their towns and cities. If you want to be a part of this movement, contact Nathan at Nathan@codepink.org. Militarized police departments have been a problem for a long time, and the terrible tragedy of Mike Brown’s death and the subsequent uprising reminds us that it is more important than ever that we take action before another life is taken because of police brutality. There was one especially powerful moment from the Weekend of Resistance we would like to share.At an interfaith event, the youth who had been fired up and in the streets for 64 days spoke out during one of the speeches at the event to make it clear theycouldn't take it any more.What they couldn't take was the endless speeches without action, the calls for healing without justice. The youth of Ferguson rose up, made their voices heard loud and clear.They are the leaders of this movement. The youth of our nation, and our world, are speaking. Taking the reins and the leadership. Making the connections between the need to end the racist wars on our communities here at home and the wars on others abroad. Taking radical action for radical change.If you're a young person who believes there's no future in war, read and sign our revolutionary Youth Manifesto and share it with your friends.If you want to mobilize young people in your community or on your campus, let us know.We’re with you.